The best kind of twigs for making twig balls is willow – hands down. There is no other wood that is so flexible and resists snapping, and also is so slender. Using the coppiced growth of willow stools which are cut right down to the ground every spring to grow up new again each year provides the most straight canes – sometimes as long as two meters or more. I use the shorter skinnier ones for smaller sized twig balls, as that leaves plenty of longer ones for other twig crafts. Twig balls are a great way to use off cuts from other projects, deformed or otherwise unsuitable canes. Look for arborists in your area that prune the long growth (water sprouts) of pollarded willows for a supply of the long slender canes. Most times they’ll be happy for you to take the prunings if you show up on the day they’re doing the work prepared to carry them away. Using some of the brightly coloured winter willow twigs such as Salix ‘Chermesina’ or even the wiggly twigs of Salix tortuosa which will give an entirely different look. 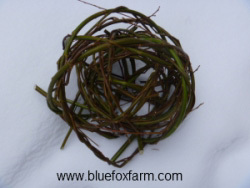 Other ways to make twig balls are to wrap grapevines in the same fashion for a crinkly looking twig ball. Use these on the top of a twig obelisk to hold all the canes together. To get your supply of willow canes ready, soak the canes overnight in water, or if the weather is really cold (below freezing) and the canes are freshly cut bring them indoors to thaw out. Sometimes you have to bend the twigs to gently break some of the inner layers of wood and make it easier to bend them without snapping. To do this, hold the cane in both hands and slowly move it back and forth pressing it on your knee. The thick end is the most resistant, so pay special attention to the area just above your hand. 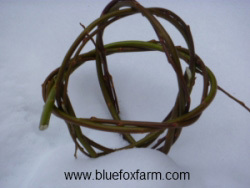 Once the twig ball is built, you can cut off the thickest parts with pruners to neaten it up. Start by making a circle with one cane, similar to the way you would start a twig wreath, by wrapping one end around the other. The friction will hold it in place, so no wiring is needed. Make two more the same size, then start interlacing and weaving other lengths among the three circles. Eventually you’ll have a solid ball, and if you keep inserting the thicker ends into it and bending them around, the twig ball will get bigger. Fill in as you go, so there are no bare spots. 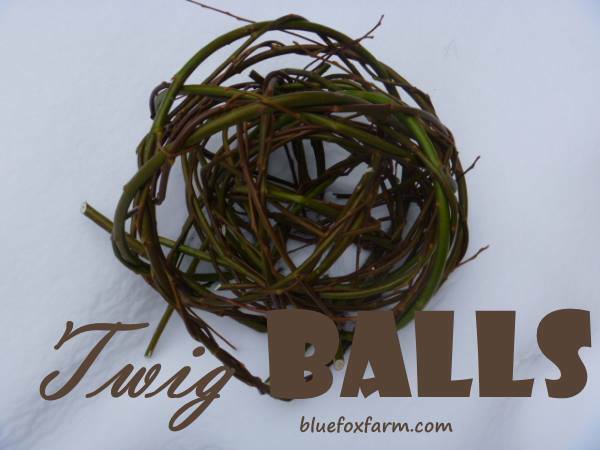 Really big twig balls – over a meter across – make great focal points in the garden. Smaller ones can be grouped together in a shallow bowl or hung from trees like strange fruit. Medium sized ones can be hung up with Christmas lights strung through and around them for a unique lighting feature, or the same idea with a stick to make a stem with the other end in a terra cotta pot full of sand to hold it up makes a twig topiary. Several of these on a terrace or patio can be stunning. As these are quite fragile and brittle, keep them under cover for the winter, or at least display them on a covered porch to prevent snow damage. Turn them occasionally if they’re on the ground to prevent them rotting on one side; if this happens, simply add more twigs and mend the break. The new twigs will change colour to match eventually. I would be willing to guess that you won’t be able to stop at just one of these fun and interesting globes. How many ways can you find to display them in your garden?